Since March 2011, 20,000 Syrians fleeing the war have entered Greece, which is ill-equipped to deal with the influx. Greek police patrol the border with Turkey. Like so many Syrians fleeing their war-shattered country, Mohamad Alkhalil did not think it could get any worse. In the space of two years, the 26-year-old had survived a bullet in his foot, severe shrapnel wounds and a long stint in hospital in Turkey and pursuit by the security forces from whom he had defected to sign up with rebel fighters in the Free Syrian Army in June 2011. "In that time, I have lost 46 members of my family, all in bombardments of our village near Hama," he says, showing pictures on his iPhone of a succession of relatives, some old, some young, who have died since the start of the conflict. "My brother Noor was killed on 20 January 2012," he adds, pointing to man with slicked-back hair standing in front of a Cadillac. "My cousin," he continues, pointing to a tousled-haired youth in a body bag "was killed a few months later. We were close and, after that, I decided my best option was to go to Europe." Alkhalil's father, a long-time opponent of the Ba'athist regime, had lived in Brussels for years. As Alkhalil lay on a hospital bed in the Turkish city of Antalya, he plotted the journey that would take him to Europe and the embrace of relatives. But that, the Syrian now believes, is where his real problems began. Sneaking into Greece across the Evros river last summer the reception was anything but warm. "I thought I was coming to Europe but Greece isn't Europe," he says. "The police immediately detained me because I had no papers and then I was put on trial. The first thing the judge asked is 'why did you defect and join rebel forces? Why did you make such a mistake?' I was just so shocked." For 10 months, Alkhalil found himself being moved from prison to prison across northern Greece. "I was jailed in Alexandroupolis, then Xanthi, then Serres," he says, noting that at least his experiences had given him the chance to learn Greek – the language in which he tells his story. "After being released last month I've been trying to get to Belgium the legal way." Alkhalil is far from alone in experiencing such hardship in crisis-hit Greece. Since the onset of their country's war in March 2011, some 20,000 Syrians have entered Greece, mostly from neighbouring Turkey, according to the Community of Free Syrians Abroad in Athens. After a fence was erected on the Greek-Turkish land border last year, growing numbers have made sea crossings instead, attempting to reach the eastern Aegean islands of Lesvos, Samos and Chios in dinghies and rickety boats. "In recent months we have seen a lot of women and children making the journey alone," said Ashraf Hasno, the community's general secretary. "Families are being split up in Turkey. It is a heart-rending sight." Human rights defenders and immigration experts monitoring the situation in Greece report that Syrian refugees have been repulsed by the Hellenic coastguard, or detained, or summarily deported or refused asylum if they manage to make such a request in the first place. "Not until 9 April 2013 was there a police decision to release detained Syrian asylum seekers and cease repatriations of Syrians," says Martin Baldwin-Edwards, who heads the Mediterranean Migration Observatory in Athens. "Many still remain held in custody." 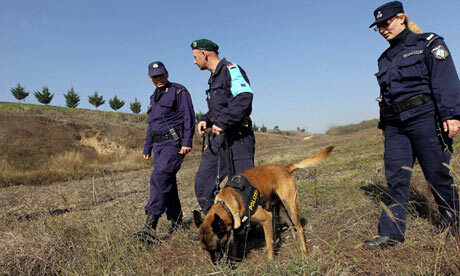 He estimates that some 2,187 Syrians were detected by the coastguard and police in the first five months of 2013. With its chronically disorganised state apparatus and debt-stricken economy, Greece is not only ill-equipped to deal with the influx but has been widely accused of acting out of blatant disregard for international conventions. "Basically Greece does not believe it has any international obligations under the Geneva convention and doesn't see why it should host refugees," says Baldwin-Edwards. "It's a big mess." In the chaos, it has fallen to Syria's exiled community to provide support. "Almost every Syrian sees Greece as a transit route to Germany or Sweden or some other place in Europe," said Hasno. "They soon find out how difficult it is and want to leave." Alkhalil is the first to agree. "In Syria the situation is very bad," he says. "But when you get to the country of your dreams and discover there is no freedom, that is even worse."